Traditionally, oral traditions were considered to diffuse only orally, outside the influence of literature and other printed media. Eventually, more attention was given to interaction between literacy and orality, but it is only recently that oral tradition has come to be seen as a modern construct both conceptually and in terms of accessibility. Oral traditions cannot be studied independently from the culture of writing and reading. Lately, a new interdisciplinary interest has risen to study interconnections between oral tradition and book culture. In addition to the use and dissemination of printed books, newspapers etc., book culture denotes manuscript media and the circulation of written documents of oral tradition in and through the archive, into published collections. Book culture also intertwines the process of framing and defining oral genres with literary interests and ideologies. In addition to writing and reading, the study of oral traditions must also take into consideration the culture of publishing. The present volume highlights varied and selected aspects of the expanding field of research into oral tradition and book culture. The questions discussed include the following: How have printing and book publishing set terms for oral tradition scholarship? How have the practices of reading affected the circulation of oral traditions? Which books and publishing projects have played a key role in this and how? How have the written representations of oral traditions, as well as the roles of editors and publishers, introduced authorship to materials customarily regarded as anonymous and collective? 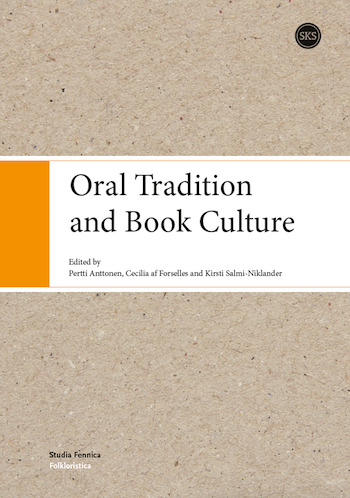 The editors represent some of the key institutions in the study of oral traditions in Finland: the University of Helsinki, the Finnish Literature Society, and the University of Eastern Finland. The authors are folklorists, anthropologists, historians and literary historians, and scholars in information studies from Finland, Sweden, Norway, Ireland, and the United States.